As 2010 comes to a close, I feel a great deal of gratitude towards my readers. Thank you so much for reading, commenting and telling your friends about Raise Healthy Eaters. Readership is up, and I know a big part of that is due to word of mouth. I constantly seek to write about topics that are relevant to your lives. That’s why I like to ask for some feedback at least once a year. Last year I asked readers to fill out a survey but this year I want to try something different. I feel like parents get pressure from all sides and the advice – and sometimes judgment – comes at lightning speed. But no one takes the time to ask parents what it is they need to do a better job of feeding. So I thought it would be fun to hold a BIG end-of-the-year giveaway where you get your chance to speak up, and win something of course. And to increase your chances, I have 5 awesome items to give away. No Whine with Dinner: The Meal Makeover Moms, Liz Weiss MS, RD and Janice Newell Bissex, MS, RD, second cookbook is finally here. If you haven’t heard of them, The Meal Makeover Moms are experts at taking regular meals and pumping up the nutrition in kid-pleasing ways. This book is filled with 150 mom-tested and kid-approved recipes including Stuffed Spinach and Cheese Pizza, Piping Hot Peanut Butter Soup and Buttery Brown Sugar Carrots. Bonus sections include 50 tips from real parents about getting kids to eat healthy. There are also blogger tips and recipes including one from yours truly (I’m in a book! I’m in a book!). California Mandarins (Cuties): The people from Cuties got in touch with me after my post about why I love the sweet fruit so much. 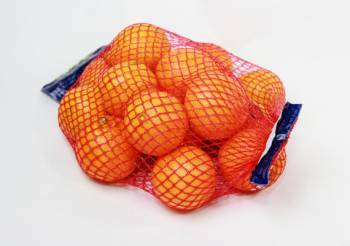 They are offering 5 free vouchers for a 3 pound bag of Cuties. That’s a lot of vitamin C that I’m sure any family could use at this time of year. Not to mention kids love them. The Why Weight? Family Pocket Guide: Jill Castle, MS, RD is a pediatric dietitian with over 20 years’ experience. 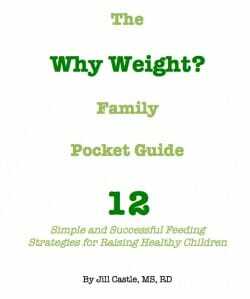 This handy book is filled with tips and insights on feeding kids with an emphasis on obesity prevention. Jill’s writing style is easily relatable, simple and straightforward. She has a way of boiling down complicated nutrition topics into easy-to-follow steps. It probably helps that she lives the part as a mom of four children. Acacia DVD Tapes: Busy parents don’t have much time to exercise – I know that! And nothing is easier and more efficient than exercising at home (try naptime/bedtime – perfect). Acacia is offering 6 of their latest DVD workouts: Shiva Rea: Power Flow Yoga, Exhale: Core Fusion Boot Camp, Joy Bauer’s Slimdown Workout, Hemalayaa: Bollywood Party Workout, Strong Body Fit Body with Erin O’Brien, and Body by Bethenny with Bethenny Getting Married? star Bethenny Frankel. There will be two winners for this one (3 DVDs each). Visit Acacia Lifestyle for more on how to stay fit. 1) Mandatory entry: Leave a comment describing one of your major feeding/health challenges and what you think would help you overcome it. It might be related to meal preparation, picky eating or your own self-care. If you can’t think of a challenge, let me know what worries you about raising healthy eaters. If you’d rather keep your message private, send me a note and leave a comment saying that. 2) I want to hear from as many parents as possible so for another entry, tweet this post or share this post on Facebook. Leave another comment. 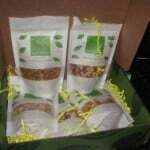 4) To increase your chances further, become a Facebook fan of Raise Healthy Eaters. If you are already a fan (now called like), suggest some of your friends become fans. Leave another comment saying what you did. Five winners will be chosen using random.org. The winners will be announced on Raise Healthy Eaters’ Facebook page. The giveaway will end Friday, January 5th at midnight. I signed up for an email feed. My son came along and he would try anything I would put in front of him. He ate veggies and would eat broccoli over hot dogs when he was 2. Then my daughter came along. Since the beginning she was pickier. I would make the same meals with orzo, chicken and veggies that I made my son and she would not touch it. She has an adversion to green veggies and now that my son is 5 he is a little pickier, but will still try anything. I serve them what I make for dinner and eat all of my veggies at dinner. My husband is picky and not the best example and I think my daughter has my husbands tastes. I wish she would be more adventurous like my son. I would love to see what to do when you have one child that is not as adventurous as the other. My challenge is getting a good healthy meal together and I know that is one shared by lots of families. I say I am going to plan ahead, cook ahead, shop ahead, etc, but it doesn’t seem to happen. My husband is part of the problem.. he is a very picky eater, and he often makes comments to the kids when I try to feed them something healthy that he might not like.. so the kids have a bad taste in their mouths before they even try it!! Commented Privately. Signed up for emails and added to Facebook. My biggest challenge is what to do when my 3yo wants to only eat her “favortie” part of any meal. She will ask for more of the favorite thing (be it rice or noodles or cherry tomatoes) and fill up just on that one thing without touching the other food. When do you say “enough rice, if you are still hungry you can eat the other things on your plate”? I have an 8 year son, who when he was little ate everything. He will now not eat anything in the way of fruits none at all. He will only eat broccoli if it is covered in Alfredo sauce. He will not try anything. Even stuff that he used to like he wont even give it a chance. To the point if i even suggest it he starts to cry. If i tell him he has to eat what is on his plate or he gets nothing else is would rather go to bed starving then even take one bite. His sister who is 19 months is still some what willing to try anything, but sees that her brother won’t eat it and starting to pick up his habits. Any help or advice I could get would be appropriated. Will be doing a healthy eating class with my cub scout boys, hoping if the other boys are willing to try stuff maybe he will to. A huge challenge for me is finding time to fit in all I want/ need to do and to cook healthy meals at the same time. I am new to the world of full-time work, and it has been a big adjustment. My husband is FANTASTIC with jumping in and cooking (as well as cleaning, homework with my girls, and everything else I’m suddenly slacking on), but he just doesn’t balance the meals the same way I would. This winter break has been good for us, though, because I got to recharge before heading back to work, and I see how I could do things differently with a little more planning. Dinner may not be perfect during the week, but the weekends can be a great time to get all the creative meals onto the table. My biggest food issue is that I am a meat eater, my husband is not, and our two children are dabblers, not sure what they want to be. On the nights I want to have meat for dinner it is really hard making a dinner that makes all four of us happy!! 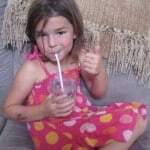 My biggest challenge with my kids is the negative food exposure they get at school. I’m working my hardest to fight against it, but I feel like I’m coming across as the bad guy/stick in the mud/party pooper/troublemaker. My biggest challenge is to find something that both of my children will eat for dinner. My son will refuse to eat more than a bite and then asks for a snack before bedtime. I follow you on Twitter and Facebook and will definitely sign up for your email. Thank you for the great blog. Parenthood is challenging in general but I find that the organizational aspects of meal planning are the toughest. Thinking ahead, having the right food available, and then following through to prepare what’s been planned. It’s all challenging! Ha. Hopeful that I will make some improvements in the new year. I retweeted the contest details too! My biggest challenge is getting a healthy meal on the table that doesn’t take long to prepare. I’d like to try meal planning but my husband often prefers to decide what he wants about half an hour before eating! My major concern is I run out of ideas to make and then get discouraged! I need meals that have real people with real work schedules in mind. I only have two hours once I get my daughter from daycare before she is tired and ready to bathe and go to bed! I do not want to spend my two hours cooking, I want to play with her and read and snuggle. I just found your blog today through Super healthy kids, I’m very interested to see what you have to say and ideas you have! Happy New year! My 3-year-old daughter decided when she was 1 that there were 4 things she would eat: fruit, cheese, nut butter and whole wheat bread. 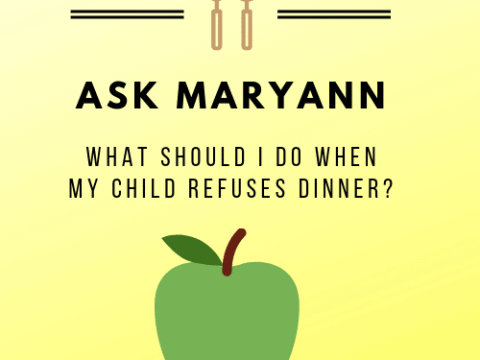 She is SO stubborn about trying new things that she will refuse a meal–or even TWO–if no foods on her “okay” list are offered. Letting her be hungry does not change this behavior. We’ve tried offering her variety. We’ve tried making it cute. We’ve even tried offering her nothing else until she tried something new–which sort of worked but was quite painful. The thing that has worked best is to offer her the same new food over & over until she finally tried it. Now she’ll eat cucumbers too. Biggest challenge- Dad is picky eatter too. Makes it hard to create easy healthy meals. My biggest challenge is to get my autistic grandson to try any new foods. He has a few favorites and that is all he will usually eat. He especially resists even considering eating vegetables. I have made spinach brownies in order to give him veggies in his diet. My biggest challenge is a daughter who is a selective eater (as described above by others). After ‘trying’ new foods consistently and positively for months, they are still not integrated into foods chosen willingly by her. My (our) biggest fear is the damage this self-imposed diet is doing to her developing body and the long term implications. As a result, I have embarked on a mission to gather as much information as possible – knowledge is power afterall. I’m very interested in eating healthy and do a fairly good job of it…when I plan and take the time to do so. My challenge is getting myself and my 2 year old out the door in the morning dressed, with a healthy breakfast in our tummies, hopefully a healthy lunch packed for me, and in the kitchen, something balanced and tasty and easy to put together for when we all get home at the end of the day. 2 days a week I work late and I want to have healthy dinners waiting for my husband and son so that my husband doesn’t have to worry about the cooking. I also need to be better at keeping essentials in the kitchen so that putting recipes together is easier/quicker. my biggest challenge, which I’ve already started tackling, is getting my 3 year old to eat what I prepare for dinner without a fight. she’s a great eater and does eat a wide variety of foods, but she gives me grief over most of the proteins and in her ideal world would have pasta every night. we have started to stand firm that she either eats what we are serving or nothing at all and we haven’t had to send her to bed without anything yet. I also have a 3 month old and plan on making all of her food from scratch. became a fan on facebook. and forgot to mention that in addition to my challenge of getting my 3 year old to eat a wider variety of foods, my husband is incredibly picky and I’m trying to make sure that my girls eat a wider variety of foods – hard to do when they see daddy with such a limited palate. My challenge is finding healthy foods, especially healthy lunch box foods, for my sensory challenged five year old who is, like many of the other children described here, a highly selective eater. On top of that she’s starting to pass on her habits to my used-to-be-an-adventurous eater – she ate camel meat when she was just 1 1/2 – toddler! Now she eats ketchup by the spoonful. I love vegetables and my husband and I are adventurous eaters who love healthy foods so it’s hard to figure out ways to keep our family healthy, especially avoiding the items out there that are packed with so much unnecessary sugar. I signed up for the RSS feed! One of my big concerns in raising healthy eaters is sugar. I feel like we are assaulted by sugar. I don’t buy many treats, but people are always giving my sweet boys treats! (My kind sister gives them a package of Oreos for every holiday, for e.g.) There is added sugar in everything, it seems. Sugar isn’t evil in its own right, but I worry about real, good food being replaced with empty calories. Just heard about you from a friend! I have what I think is a typical toddler – he used to eat whatever we put in front of him (even dined at an Indian restaurant and he loved it). Now he sometimes eats and sometimes doesn’t. I would chalk it up to typical independence/distractedness. Developmentally, he’s in great shape. BUT… he hasn’t grown much in the past year and Dr. is concerned; if his growth curve isn’t improved by our next weigh in (early feb), we’ll need to start a food log and look at “options,” whatever that may be. All along we’ve been doing what the books say – regular meal times; variety; healthy choices; don’t make a big deal about whether or not he eats. But lately with the concern over growth, my husband and I find ourselves wanting to do Anything to get him to. Just. Eat. Something. It’s hard not to give in to the bribery urge because it works short term. I know that’s just setting us up for bad habits, but we’re finding ourselves at a loss. The idea that “he’ll eat when he’s hungry enough” does not seem to be playing out for us, considering his lack of growth. I’ll be exploring your site for more constructive ideas! My biggest issue for my 2 year old as well as my husband & I is getting enough green vegetables in our diet – we eat a lot of fruit, but miss the green leafies! My brother recommend a “green smoothie” – a regular fruit smoothie with spinach mixed in and so far so good! My daughter doesn’t even realize that she’s drinking spinach with all of that fruit. I want to find MORE ways to do the same thing. Became Facebook fan and posted link to post on Facebook. I’ve really enjoyed reading all the responses. In addition to what I posted already, so many of the challenges mentioned by others are ones that my husband and I share. So many to choose from to share, lol! My biggest challenge is trying to find food that everyone in my family likes: if the teenagers like it, the little ones won’t and vice versa. My goal is to try to incorporate more vegetables into their diets by offering more at dinners and snacks. I’m hopeful this will encourage all of them to start eating the same things. Finding ways to incorporate veggies that we all like. Finding meals that work for everyone (My husband and I like things spicy, for example, or soups are hard for a two year old). Was a winner announced? I couldn’t find it on fb? Thanks!